"It starts with the scene in The Voyage Home where Saavik and Amanda are watching the Bounty take off for Earth and the trial of the Enterprise Seven. Saavik is more or less at loose ends, a bit shell-shocked from recent events, and trying to decide what to do with the rest of her life. She signs up for what she hopes will be a quiet mission on a science vessel cataloguing plants on a distant world, and ends up fighting for her sanity and her life against forces from her past trying to lay claim to both. It’s a bit of a murder mystery, a bit of a spy novel, with a love affair tossed in for seasoning." She also describes how she used Saavik's backstory as established in The Pandora Principle, including some flashbacks to that period. 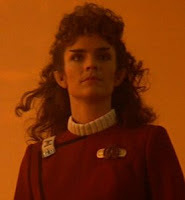 The interview also discusses her other Star Trek work and her writing in general, check it out, here. This does sound good. And thanks for using the Robin Curtis picture. Everybody always talks about Kirstie Alley, but Robin really owns that role! Well Robin Curtis seemed more appropriate for the book. In general I actually prefer Kirstie Alley Saavik.